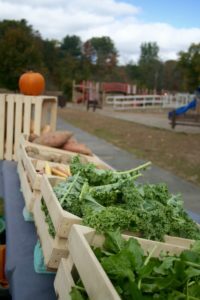 For the third year, our Red Bag Family Share brought local vegetables and fruit to sites around Northampton this fall. 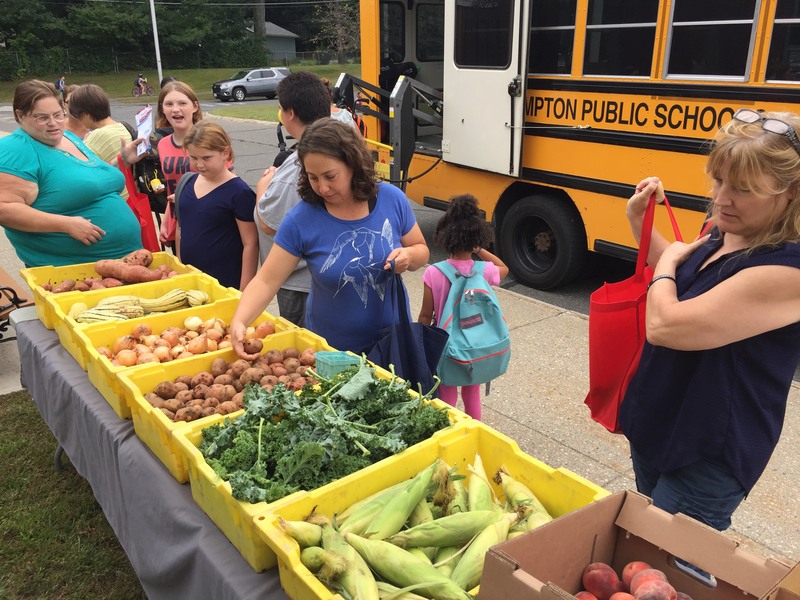 In response to feedback from participants, we added more choices and additional sites, so that purchasing local produce was more attractive, accessible, convenient and affordable for low-income Northampton families. Families fill their bags at Ryan Road School. Each week for the first 10 weeks of the school year, families were able fill their bags with a variety of produce. Being fall, there was lots of salad greens, kale, potatoes, enormous sweet potatoes, squash of different varieties, and more, including fruit! Delicious apples from Apex Orchard were purchased through River Valley Coop at their wholesale cost. This year we added a choice between Small and Large Shares, based on demand from past participants. A crisp fall day at Ryan Road School. Thirty-eight families participated in Red Bag this year including eight full-pay shares, which was a first for us. 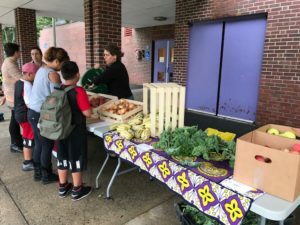 Offering a full price share for the first time, not subsidized by Grow Food Northampton, meant that families who don’t have SNAP or Free and Reduced Lunch could participate. The effect was great, in that it erased the lines between the families that receive a subsidy and those that don’t. Once families signed up, regardless of how much they paid, they became shareholders equal to everyone else. The idea to offer full-pay shares was suggested by the Ryan Road PTO. We used the same ‘choice’ model that we developed for the Senior Share and Mobile Market Pilot earlier this year. 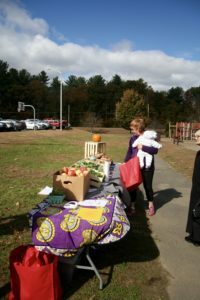 The set-up of a the farmer’s market-like display meant that we spent more time at the schools and facilitated more interactions between us and the families and the families with each other. 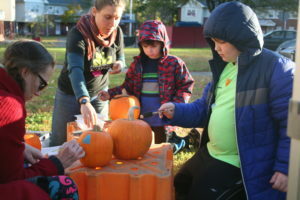 Pumpkin painting at Hampshire Heights. A busy afternoon at Jackson Street School. We are grateful for funding from the Jackson Street and Ryan Road PTOs, Harvard Pilgrim Health Care Foundation, Cooley Dickinson Health Care, Rotary Club of Northampton, City of Northampton Whiting Street Fund and the Community Foundation of Western Massachusetts. In-kind support was generously provided by Jackson Street and Ryan Road Schools, Mary Cowhey at Jackson Street, Crimson and Clover Farm, the Hampshire Heights Tenants’ Association and River Valley Coop. Thank you to all of these groups! 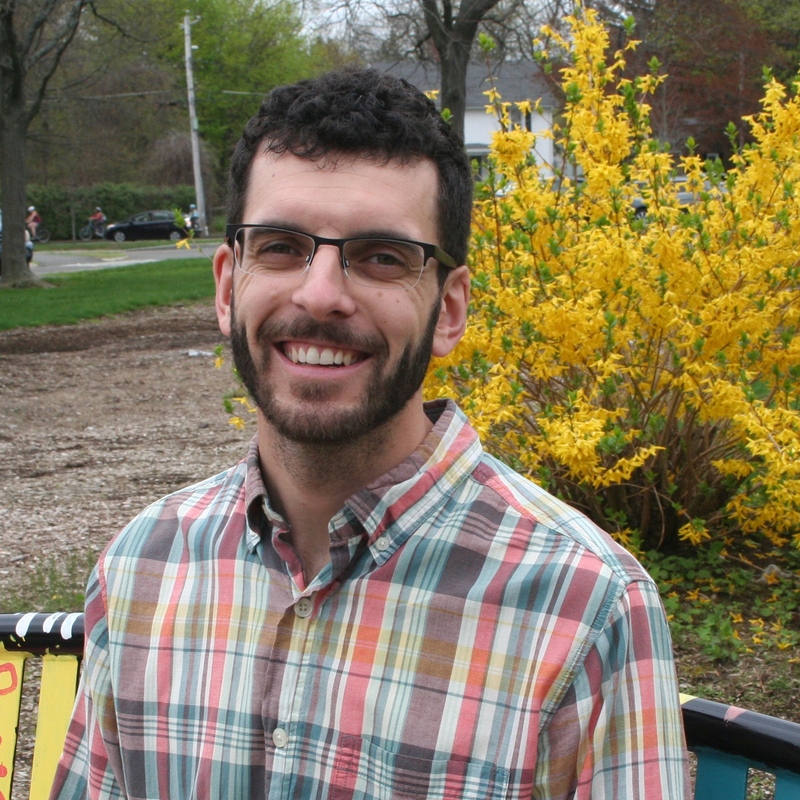 This year’s Red Bag Family Share was led by Grow Food Northampton’s Director of Programs, Michael Skillicorn. Ellena Baum provided weekly assistance on-site. 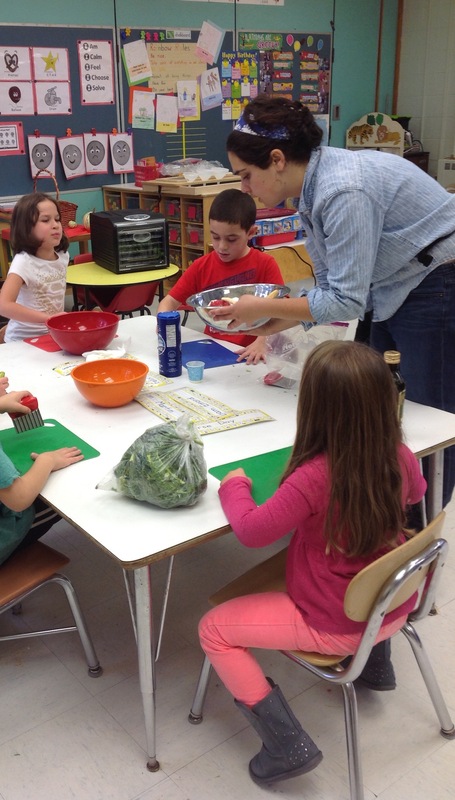 Michael and Ellena enjoyed interacting with families each week and chatting about the produce and recipes. One participant commented “Red Bag has meant THE WORLD to me, thank you, given that I am on food stamps and have no car. Plus the service from Michael and Ellena has been AMAZING. Everyone here LOVES THEM! !” We’re happy to report that 100% of those surveyed said they want to participate again next year. One afternoon of delivering shares stands out for Michael: “As we all know, this was a rainy summer… On one Thursday, the rain was coming down pretty hard and I set up in the Gazebo at Ryan Road, thinking I was a smart guy. Then it started raining harder, and the parking lot flooded all around the Gazebo, leaving me stranded and surrounded by an 8 inch deep moat. My boots got soaked so I took them off and rolled up my pant legs. A mother and her two daughters came to get their share, and the girls started playing in the water. Next thing I know, they’re belly-down, pretending to swim in the parking-lot puddle. A good lesson to take it as it comes! Later, at Florence Heights, I set up, still in bare-feet. A woman came out of her apartment who had never shopped before and, as she was checking out, she said ‘I’m here because you’re here'”. 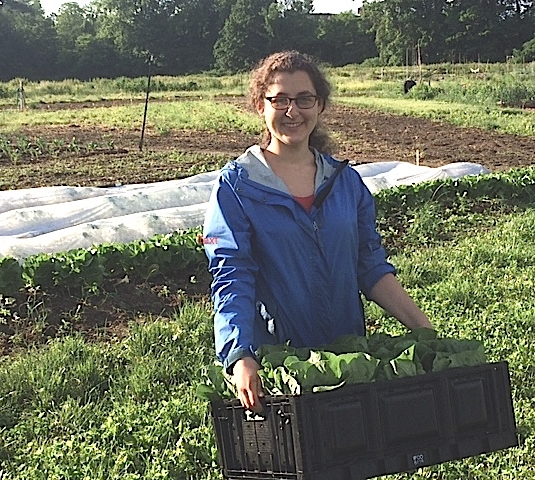 Summer Internships with Grow Food Northampton!